Do you ever feel like you and God have drifted apart and that the love and joy you once experienced with Him has faded? If you do, you’re not alone. Most Christians feel like the experiences they have with God diminish over time and that they need another touch. But is that the way it should be? The Bible says God will never leave us nor forsake us (Heb. 13:5). If that is true, and it is, who moved? As born-again believers, we are all capable of living in the fullness of God every day of our lives. God is continually pouring out His love, joy, peace, revelation knowledge, and every other blessing. But, we can get to a point where we’re not receiving and ‘feel’ like He has drifted away. This scripture contains four separate elements, or keys, that can lead us into and keep us operating in the fullness of God. Expressed positively, they are: glorify God, be thankful, recognise the power of your imagination, and have a good heart. You have the power to control each of these in your life. In many places throughout the Bible, the word ‘magnify’ is the same word translated ‘glorify’. Therefore, ‘magnify’ and ‘glorify’ can be used interchangeably. And ‘magnify’ means ‘to make bigger’. Most of us have become masters at enlarging our problems and minimising God and His Word. I remember a lady who thought she was pregnant but found out she had cancer instead. The doctors said she needed a hysterectomy immediately. They said she only had a fifty percent chance of living, and she wouldn’t live more than two weeks without surgery. I started magnifying and glorifying God. I made the Lord bigger and the cancer smaller. The only thing that made the cancer insurmountable was the value she was placing on what the doctors said. They even called her a fool for refusing treatment and made her sign paperwork to absolve them of liability ‘when’ she died. But she decided to stand her ground and believe God. It’s now been almost twenty years since she refused that operation – and she has a number of children. Paul listed unthankfulness as one of the signs of the end times and put it in the same verse as covetousness, pride, blasphemy, and unholiness (2 Tim. 3:1-2). Not many would argue that we live in a society full of unthankful people, even in spite of the fact that we have more prosperity and opportunity than any people who have ever lived. Bless the LORD, O my soul, and forget not all his benefits” (Ps. 103:2). Being thankful involves both humility and memory. Humility is the understanding that you didn’t accomplish these things ‘on your own’. Then, humbly remembering the good things He has done for you always brings thankfulness. So it’s important to look back and rehearse your victories and remember whose power brought them to pass. A few years ago I took a trip to Israel. I remember stopping in the valley of Elah. I got out of the bus and walked down to the little stream. I picked up five smooth stones just the way David once did. I began to imagine what it must have been like for David when he faced Goliath. The story came alive. The Word of God comes alive when you can picture what it’s talking about. Let the Word of God control your imagination as you think about scriptures, and you will see things in Scripture that you can’t see with your physical eyes. You see it on the inside … in your imagination. When the Bible says you’re healed, you’ve got to meditate on that truth until you see yourself healed. Most people allow their imaginations to become vain and agree with the image the doctors have painted rather than the Word of God. They’re told what is going to happen, and they imagine it as truth. When we fail to be thankful and glorify God, our imagination automatically becomes vain. That doesn’t mean it isn’t working; it just means it begins to work against us. A person with a vain imagination is a pessimist, imagining failure instead of success. We need to use our imagination to agree with God’s Word and see ourselves the way God sees us: happy, healthy, and prosperous. A good man out of the good treasure of the heart bringeth forth good things: and an evil man out of the evil treasure bringeth forth evil things” (Matt. 12:35). For from within, out of the heart of men, proceed evil thoughts, adulteries, fornications, murders, Thefts, covetousness, wickedness, deceit, lasciviousness, an evil eye, blasphemy, pride, foolishness: All these evil things come from within, and defile the man” (Mark 7:21-23). Your heart controls what you say, and it also controls what you do. All of the above are products of your heart. The opposite of those can be true also. Love, joy, peace, patience, and the rest of the fruit of the Spirit are also products of what your heart believes. The reason the heart responds in a negative way is because you allow it to be dominated by external, or physical, things instead of by the Word of God. Our understanding is then darkened, and we become insensitive to God. We actually cause our hearts to become hardened. The word ‘harden’, according to the dictionary, means cold, insensitive, unfeeling, and unyielding. When our hearts become hardened or insensitive to God, they automatically become sensitive, dominated by, and controlled by our physical senses. So what do most people do when they realise their actions, which are being controlled by their hearts, are causing problems for themselves and others? They resort to behaviour modification. They try to change their actions without changing their hearts, and that never works long-term. If you want your behaviour to change, you must change your heart. Make sure that the Word of God is the dominant influence. What I have written here is only an excerpt from the teaching on this subject. 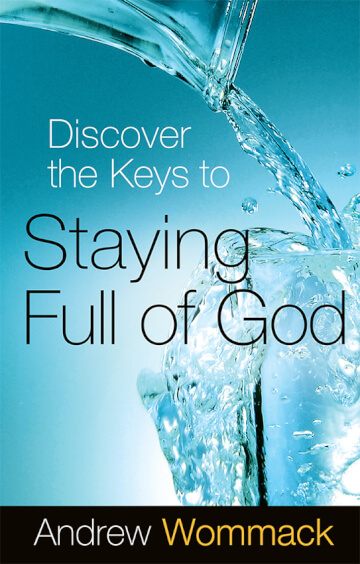 My new book, Discover the Keys to Staying Full of God, has just been released. In addition, I have released the companion Study Guide, a great tool for individual or group study. In them, I teach on this subject in depth. You can also order this teaching in CD, tape or DVD album format. To order, click on one of the above links, call our Helpline on +44(0)1922 473300 or write to us. P.S. Nearly every day, I read the ‘Guest Book’ on our website. People from all over the world post their testimonies and comments about how the message of God’s unconditional love and grace has changed their lives. If you have never read it, take the time to do so. Those changed lives are the direct result of your faithful giving. On their behalf, Jamie and I want to tell you THANK YOU!